When you sign up for a Google Voice phone number, you will be able to choose an entirely new phone number that is connected to your original cell phone number. This is a nice feature because you will never need to share your personal cell phone number with parents or students. This phone number can be placed on your website or at the top of your syllabus. You can also set Google Voice to ring multiple phones at once. For instance, if someone calls your Google Voice number, it will not only ring your cell phone, but also your house phone, work phone, and second cell phone all at the same time. No reason to ever miss a call! (Not sure if that is entirely a good thing though...) You can even set up multiple voice greetings and customize which caller hears which greeting. So Mom or your best friend will hear a different greeting than if the parent of a student were to dial the number. Lastly, there is a Google Voice App that you can download to your iPhone or android device. If you are a Chrome user you can also download the Google Voice Extension from the Chrome Store. This extension places a notification icon in the menu bar of the browser in order to quickly show you if you have any new incoming messages. You can text directly from the extension as well. If you can think of any other good uses of Google Voice - let me know. *If you forward Google Voice text messages to your cell phone standard text rates will apply. Any texts sent directly via. 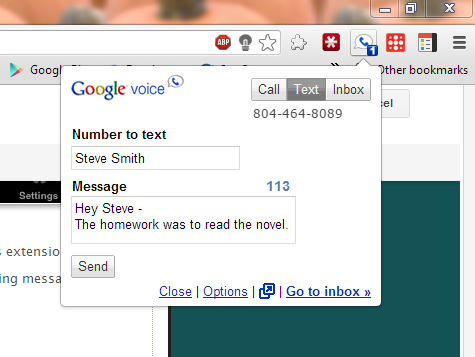 the Google Voice Interface is free.